We Help Groups Break the Ice! 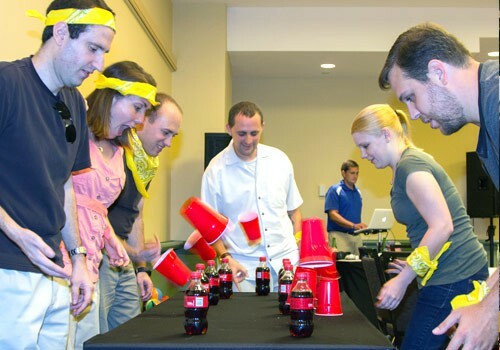 These events aren’t stand-alone events, but rather are designed to kick-off a meeting, provide a break in the meeting action, or enhance a party to get your guests to interact with one another in a non-threatening way! This themed mixer will certainly liven up any beach or Polynesian-themed party or reception! 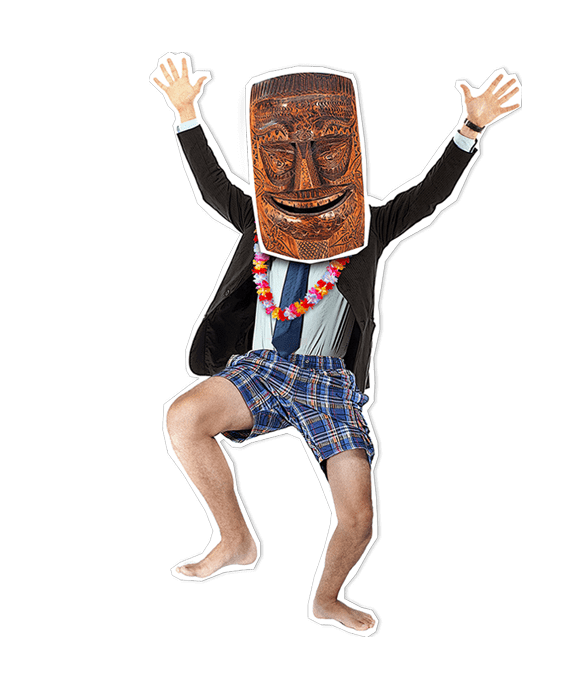 Guests earn leis as they mingle with others, playing a Mad Libs-style game that results in hilarious Advice from the Tiki Gods. During this popular beach-themed activity guests get beach balls with letters on them and must mingle with others to form beach-themed words. “Lifeguards” give leis to guests for each word formed. At the end of the party, the guest with the most leis wins. This is the perfect activity where guests are from different companies. Guests receive a custom printed booklet that can hold up to 12 business cards. In it are the instructions for the activity, a place for their own business card and a description of each of the different business cards guests need to collect. Collect all 12 and you’re entered into a grand prize drawing, but the cards are yours to keep! This is the perfect accompaniment to a casino party night. Or, it can stand on it’s own! Guests win poker chips throughout the evening by taking part in card-themed activities including a mixer where they form human poker hands and card-themed competitions that pit players against one another on stage. Guests eliminate suspects, motives and locations by viewing what’s written on other guest’s nametag lanyards. The mystery is customized for your group. For instance, a wedding rental business may have to figure out who knocked off the Mother-of-the-Bride. Was it the Groom with the Cake Knife at The Bachelor Party? Or, was it the DJ with the Garter in the Florist Shop? Guests hunt down clue stations placed throughout the hospitality event. For instance, a clue may be printed on a cocktail napkin, or be attached to swizzle sticks at the bar. More than a solution is revealed – so too is corporate information woven into the clues. Guests solving all of the clues are placed into a grand prize drawing. Usually if guests are on their phones during a party, you may think they’re not entertained. But, not so with this activity! In this event, a series of tasks can be accessed via guests’ own phones or tablets that they must do with fellow guests, encouraging them to make a connection. They may have to make a funny face with someone else in a photo, get someone to help them answer a question, or interview someone on video, allowing them to interact in a fun and non-threatening way. Research shows that people should get up and move around for at least ten minutes every hour. Not only is it healthy for their bodies – it’s healthy for productivity as well! So, get your meeting attendees on their feet for fun energizers led from the stage during breaks in your meeting and you may just get a healthy standing ovation as well. Guests become mixologists as they get a lanyard imprinted with a cocktail ingredient and are invited to blend with others to create different mixed drinks. For instance, a guest wearing a “vodka” nametag could find someone wearing “tonic” and both would get a swizzle stick. The guest with the most swizzle sticks drinks in the glory and wins a prize. As your guests roll into your party, you can make their evening rock by giving them a fun way to mix and mingle with others. Option One is an upbeat guessing game that has people solving clues to complete the partial song titles worn on other’s name badges. If they have the chops to find and solve all ten, they’re entered into a prize drawing. Option Two finds all working together in harmony to form song titles with the words on each other’s name badges. The more people they meet and song titles they make, the more guitar picks they collect and the one “picking” up the most wins a prize! Guests share with other guests their answers to various “If statements” they are each wearing on a name badge lanyard. For instance, “If I could only eat one food for the rest of my life it would be…” Guests who collect a certain number of answers to their question from different guests by a set time are entered into a prize drawing. And, if their name is called out, the people whose answers they collected also come on stage to see if they remember their answers and they too win a prize! Plan Your Icebreaker Event Today! Planning a holiday party? 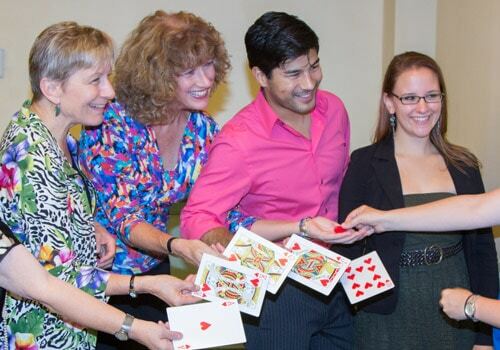 Learn how our icebreakers can ensure a successful event. 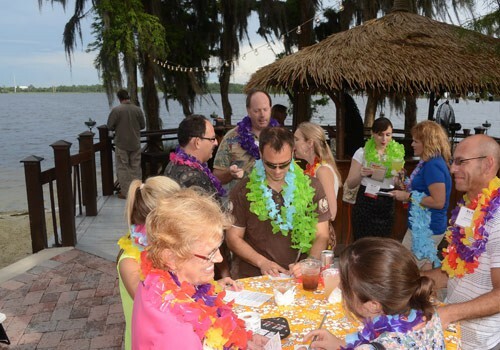 Guests received 6 leis, all in the same color, and five “Mad Lib-style” pieces of advice to share with colleagues. Before the advice could be shared, they had to ask the person they were talking to for types of words (a verb, noun, adjective, etc.) to fill in the blanks on the advice. Once the blanks were filled in, they read the humorous advice out to the person and swapped a lei with them. Once they had 6 different-colored leis, they submitted their name into a prize drawing. 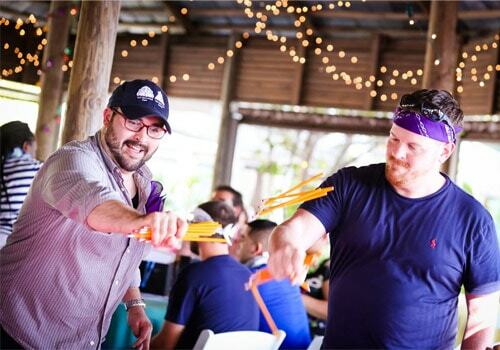 Ready to Plan An Amazing Icebreaker or Mixer for Your Event? Contact Us Today.